The iPad is the cruelest tablet, breeding bacteria out of its touchscreen, mixing photos and emails, stirring FaceTime grimaces with ringtones. Smart covers keep it warm, covering glass in vivid polyurethane, feeding you poetry with a new, amazingly literary app. 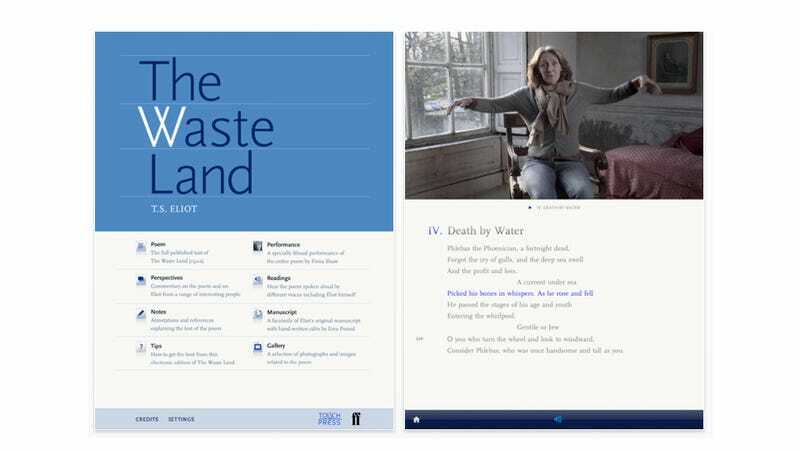 If you like TS Eliot's poetic megaton The Waste Land, you will almost certainly want this app. It includes, of course, the full text of the poem (easily navigable), a variety of audio readings (including two by Eliot himself, and one by Viggo Mortensen! ), plus a video rendition. You can swap between readers on the fly, should you want The Burial of the Dead by Viggo and half of A Game of Chess read to you by Eliot. A little confused by the extraordinarily rich work? The app packs explanatory notes to help decipher, and over 35 video commentaries. Is this a niche app? Yes. Will it be downloaded a lot? Probably not. Is it brilliant, and an amazing way to experience an amazing poem? I think so!